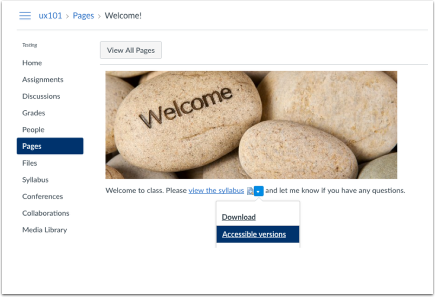 For more information about Yale's accessibility guidelines, please visit the Usability & Web Accessibility page, or contact accessibility@yale.edu. Yale’s Poorvu Center for Teaching and Learning is piloting Blackboard Ally in Canvas @ Yale this fall 2017, bringing alternative accessible formats of content shared through Canvas into the hands of any student at Yale. These automatically generated alternative accessible formats include Semantic HTML, audio, ePub, and electronic braille. 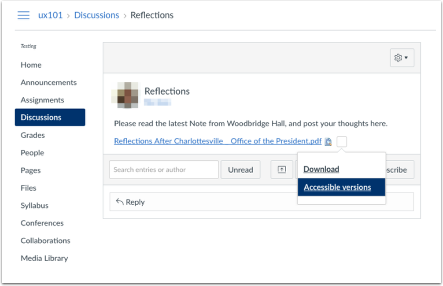 Throughout the course site, students and faculty will notice a small down arrow next to content linked to from various tools in Canvas. 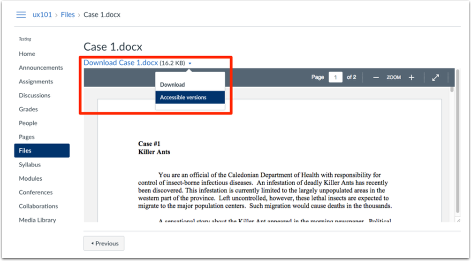 Clicking on this down arrow will surface a pull down menu inviting participants to download the original file uploaded by the instructor, or to choose from one of several more accessible versions for download. Accessible versions of content are generated on demand, and downloaded to your local computer. Coming in spring 2018, our pilot will extend to include Instructor feedback feedback about the accessibility of their course materials and guidance on how to fix identified accessibility issues. If an instructor has chosen to link to a downloadable version of the syllabus, accessible versions of the file will be available through the submenu. When accessing content through the Files tool in Canvas, hover over the file row to the far right, and a gear icon will appear. 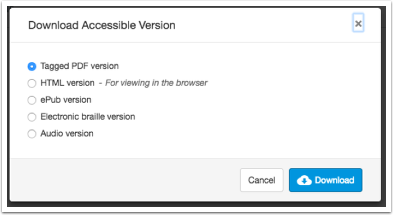 When available, the Accessible versions menu will be present to access the desired alternative format. Another path to accessible versions is when a file is selected in the Files tool, a small icon appears towards the top of the list of files. This only appears when one file is selected. Alternatively, if you have already clicked on the file to view in preview mode, accessible versions are made available through a button on the top of the screen. 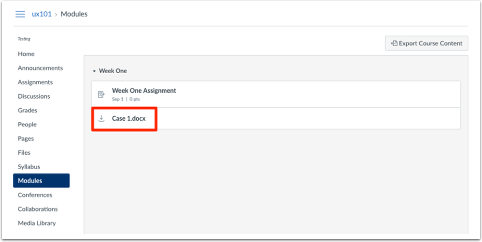 When content is shared directly from within an Announcement posted in a Canvas site, accessible versions of that piece of content are available when the students logs into Canvas directly to view the announcement from within the course site, as shown here. 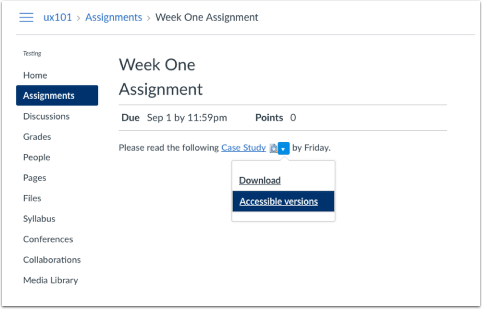 Content shared in an assignment by the instructor will have accessible versions made available through the available menu, but student submissions will NOT be scanned by Ally and will not have accessible versions made available to the faculty member or to peers during a peer review. The accessible versions of the content are found within the top portion of the window. Content linked from discussions by the instructor will have accessible versions available. Content shared by students will NOT be scanned by Ally, and will NOT have accessible versions made available to readers. Next: How to Reserve a Time Slot in Sign-up Tool?